There are lots of reasons to become a member. Firstly cheaper golf, being a member really does bring down the cost of playing golf regularly, and with our new points membership irregularly as well. As a member you will also benefit from discounts on golf car hire, discounts on food and beverage and substantially reduced rates for your guest green fees. You will also benefit from being able to join in our busy competition calendar, hold a proper club handicap and be a member of the Northants and English Golf Unions, and we hope that you will enjoy our other facilities on offer and have the opportunity to make new acquaintances and friends. You will be a member of one of the most challenging and beautiful of Northamptonshire's Golf Courses, whose tranquillity and unique location are second to none. We believe you’ve discovered a hidden gem. Finally, you will be getting all of this at some of the best subscription rates and joining fees in the area. Classic Membership - You and your family can play as often as you want for one annual fee. Full 7 Day Membership - Covers you, your spouse, and any children or grandchildren under the age of 21* for 365 days of golf ! Full 5 Day Membership - Covers you, your spouse, and any children or grandchildren under the age of 21* - Weekdays Monday to Friday all year ! “Early Worker” Membership - Under 30’s Membership. Covers you, your spouse, and any children under the age of 21* - All week all year ! Senior Citizen Membership - Over 65’s membership. Covers you, your spouse, and any children or grandchildren under the age of 21* - All week all year ! *Please note children under 16 years must be accompanied by an adult when playing golf at Farthingstone under these memberships. 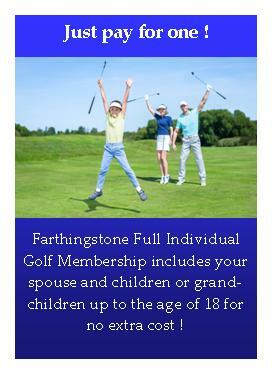 If you play Farthingstone and decide to join we will refund the green fees you paid that day! If you join as a points member but decide your better off being a full member we will use the value of your points against your full membership subscription!